Here are two regulators that I designed for my SMPS project (which I will post when I get the time to write everything and tweak it) but found out they were not needed. They however might be useful for some people. This first one was for my boost converter. Since the voltages are greater than the op-amp's, the circuit in my prevous topic posted would not work. It works by using an Class A amplifier, which is an inverter, and the op-amp to counteract this invertion to make it regulate higher voltages than it can output or handle. I included an voltage divider to the sensor so that in voltage adjustment can be less to adjust the output voltage. If you want the voltages to be even greater than the op-amp's power output currently (which I set in the schematic to a multiplier of 2), change the resistors in the divider for the sensor. Wikipedia has a great equation to find the desired multiplier. I also changed the tranistor attacted to the design with a mosfet to save more power and be more efficent but a transistor will also work fine. This second regulator was ment for my buck-boost converter. This one however caused be great fustration to make because I wanted the op-amp to run from the input voltage to ground. Since the buck-boost creates negative voltage, it caused the transistors to act in undesired ways. Thus I solved it with the circuit below. 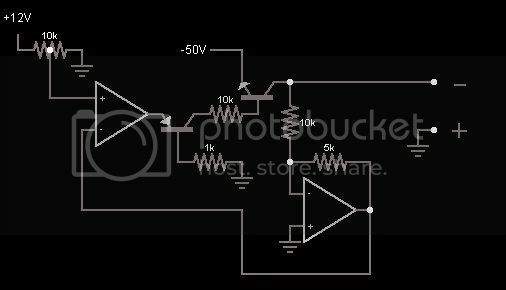 The secound op-amp is used to invert the negative voltage to a positive one (and also divide it by 2 thus causing to to multiply it to 2 times the input reference for the output) for the sensor to work. I also had to include a 10K resistor in the middle of the circuit to prevent the op-amp from dumping a positive voltage into the circuit to confisate for a lack of negative voltage when starting (and therefore stopped the positive voltage from preventing the negative voltage from building). 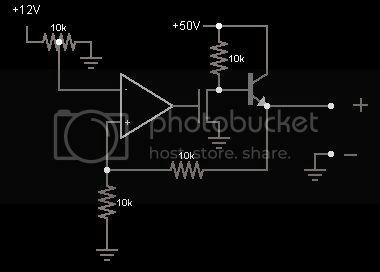 This circuit can also be adjusted to have higher outputs by the divider (which does not follow the voltage divider equation but rather the divided amount of the higher by the lower).